Why Does God Call Us to Pray When He Already Knows The Answer? So why does the Lord call us to pray, when He already knows the answer? I believe it has less to do with the situational outcome and more to do with our eternal outcome. Recently, a question has come up that has been stirring around in my heart. The Lord has been working to bring answers, as the enemy battles for confusion, and so I press into my God even more heavily and attempt to give to Him these pieces that don’t make sense. There have been many questions in this season, but there is one in particular that keeps coming up and that I feel The Lord bringing clarity to today — even in the midst of great tragedy and pain and loss. The question is this: If God already knows the answer, and has decided the outcome, why pray? You see, here in Greene County, Virginia, this is where many of us are at — this crossroads of faith and confliction. This is where many have ended up after the past month. Just recently, an incredible man was taken from us — and to be frank, death just doesn’t make sense here on earth. It never does. Our souls feel deep down the truth and the longing for the original and perfectly intended design. Death is contrary to our creator’s first desires for us, brought on only by sinful nature entering this world through Satan’s enticement and our choice, and the ache it creates inside us is unmatched. Death in any form is hard. On that day though, death hit especially hard. We lost one of the best men that any of us have ever known. A leader, a true follower and example of Christ, a father and husband, and friend that inspired countless people, a servant, and an unbelievable example of love in action. This loss, by itself, is so hard to comprehend. But then what do you do with it when just days before he passed, hundreds in our community had gathered together to beg God through tears and passionate cries, to plead with Him for our friend’s life? Many of our leaders felt a call to gather together and to lift Him and the family up in prayer. So we did. We met one night for an hour and lifted up many voices as one. Please don’t take Him. Please let us keep Him here. God hears our cry. Heal this man. Wake him up. Show your glory in this way. We ask you. So what happens when we don’t get what we asked for? If God knew already that night that the plan was to bring this man home to heaven with Him, then why would He ask us to pray? Was there a default in our prayer or a flaw in our faith? Was something missing? Or did God just ask us to pray but then withhold anyways? Is He angry? Is He mean? Is He unfair? The reference repeated itself throughout the night until I finally woke in the morning to have it engraved in my heart. I flipped through and read and studied and prayed, wrestled with the text and why God had decided that I needed to read it today. Then I went to a meeting and we discussed this same question: If God knew the answer, why did He want us to ask Him? Why pray? To what end? I drove home and that reference engraved in my heart lit up as though on fire: John 15. Verses 4 and 5 especially replayed, until my mind was in a spiral. I love the imagery that is painted here of vines and branches. I love the way that it speaks to our beings as intended and crafted and created specifically for connection to our Savior. These words read off the page to say to me — I give life, and you are designed to live in constant connection with me and through doing so receive all that you need. Isn’t this prayer? Isn’t the opportunity to sit down and offer up any and all emotions and requests and decisions and heartache and celebration…to offer up every piece of our hearts and souls to Him… isn’t that the epitome of connection? 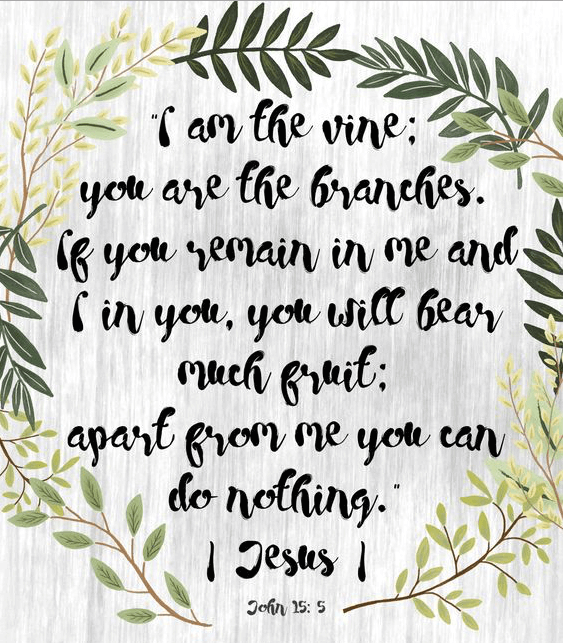 “Remain in me.” As my heart marinates in that simple command I am reminded that in the midst of life — much attempts to draw me away, and it is often through prayer that I am able to set all things aside and cling, to re-enter into connection with Him and remain grounded there. Scripture tells us here that those who remain in Him, those who stay connected — perhaps through prayer — they bear fruit. It does not say that through this connection they gain a genie who grants every wish of our own will, but it says they bear fruit. It tells us that the Holy Spirit inside of them stirs to bring forth these things that cannot come of our own doing. In Galatians, we find the fruit of the Spirit listed as love, joy, peace, patience, kindness, goodness, faithfulness, gentleness, self-control. I wonder if our call to prayer — even in dark circumstance, times that hurt, situations when the outcome won’t be what we would have wished for — is ultimately designed, not to bring us to place of avoidance of pain, but rather to provide for us in the pain? If prayer is the vessel that brings us to a place of experiencing a connection to the Spirit and producing those incredibly necessary pieces of fruit for our souls and for others. Perhaps the reason we are called to pray even when our Heavenly Father knows the outcome will be other than what we ask — is because, in His great love for us He knows that when push comes to shove and we experience the brokenness of this fallen world in full force, that we will need the presence of His Spirit and the comfort of Him ministering to us. And He longs to provide those gifts even before we have come to need them. As we gathered together that night for prayer, and as we lifted up our requests — Our God still knew that our friend was being called home to heaven to be reunited with Jesus. However, in those moments as a community and a family, and in the hospital room prayers, and the prayers at the families home, and everywhere in between; Our sovereign God connected with us and began to work in us each what He already knew we would need in the coming days, weeks, months, years: love, joy, peace, patience, kindness, goodness, faithfulness, gentleness, self-control. In His ultimate grace and mercy, He called us to prayer so that we could lay down at His feet our deep pain, and begin to pick up His deep providence. I am reminded of the comforting truth that we ourselves are not facing anything that Jesus did not already face and defeat before us. In this instance, I am brought back to Luke 22:42-43. In the final moments before Jesus knows He is about to be betrayed and tortured, and brutally murdered – and then also bear on his shoulder the weight of sin and separation for all of mankind…we see Him go to prayer. In the midst of the deepest pain, knowing that the outcome will be terrible, He still draws close to His Father God. 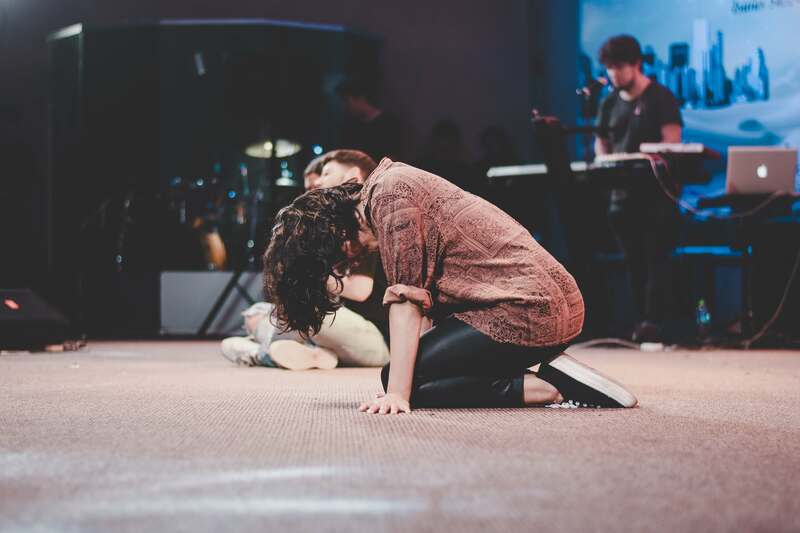 I think what we see in this picture of pain and surrender is powerful and beautiful. We see our Savior honest before God in His request. We see Him experiencing the fullest weight of pain, and we see that He recognized truth for Him and for us — that even when it seems darkest, even when we don’t see or understand, still the will of God is supreme. And even though Jesus’ suffering was within that plan, and His request did not change that path, what it did do, was engage in connection with God, which resulted in the son of man being strengthened. The pain did not leave. But through that pain, He was equipped. So often, our pain does quite the opposite to us than what Jesus allowed it to do for Him. Rather than drawing closer to God in prayer and honest lament and requests and submission — we often allow our pain to pull us away from our God and instill in us a deceptive pride that we know what’s best and that God must not be for us. When we enter into consistent prayer and connection with our Savior — what we find is not always the resolution of our pain, but the fulfillment of the promise of His presence. We experience Him instead of experiencing defeat. We are filled with hope instead of filled with terror. We are made to become fruit bearers — so that not only us, but everyone around us experiences what can be achieved only by the Spirit of God; love, joy, peace, patience, kindness, goodness, faithfulness, gentleness, and self-control — even in the midst of the deepest pain. So why does the Lord call us to pray, when He already knows the answer? I believe it has less to do with the situational outcome and more to do with our eternal outcome. It’s because prayer enters us into His presence, unlocks the power of His Spirit in us, and provides healing and direction.. and in making our requests known to Him — He often provides answers to the questions that we have yet to ask. Kristy Fry is a Youth Pastor in Ruckersville, Virginia and her heart beats passionately for her Lord and Savior, Jesus Christ. When she's not loving on students and lifting others up, Kristy spends her time painting, writing, and hanging out with her hubby Brandon.